One of the vehicles left behind in the village when Isla Sorna was evacuated. 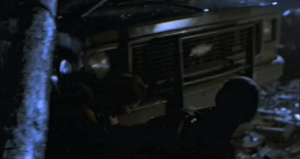 This vehicle was used by Ian, Sara and Kelly as they tried to escape from the Velociraptors in the village. Trying to distract the Raptor, Ian pounded the car with a stick to make noise so that Kelly and Sara could escape.